The BORP Bombers, Crushers and Bay Earthquakes hosted tournaments on March 2 and 9 and all 3 teams thrilled their fans and coaches with non-stop spirited play and excellent teamwork. It is clear that all the players are having fun and making the most of every opportunity to be competing and cheering for their teammates. A highpoint for me today was seeing so many Bombers players come out to support the other BORP teams even though they had no games or practice. This community spirit and competitive fire starts with the coaches and so a big thank you to Chris, Kendra, Julie, Joe, Steve, Rich, Evonn, and Travis for providing wonderful leadership and commitment to the improvement of every athlete. Congratulations to Vasilis Rousseas for his new baby and his first Earthquake goal! The BORP Bay Cruisers are the Western Conference Champs! The 2013 Western Conference Champion BORP Bay Cruisers. Photo courtesy of Loren Bohnett. 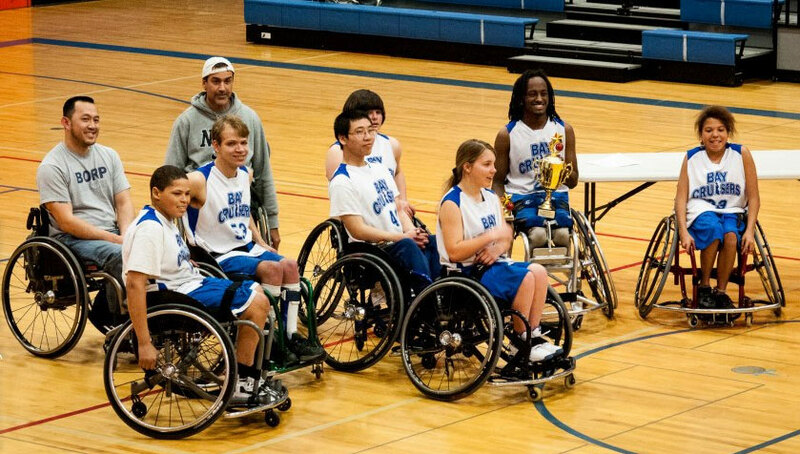 The BORP Bay Cruisers Varsity team went to Portland, Oregon on March 2 & 3 on a mission. The team needed to win the Conference Championship in order to ensure a spot in the National Championship Tournament in April. Entering the weekend, BORP was ranked #7 in the country and secured the top seed in the tournament. 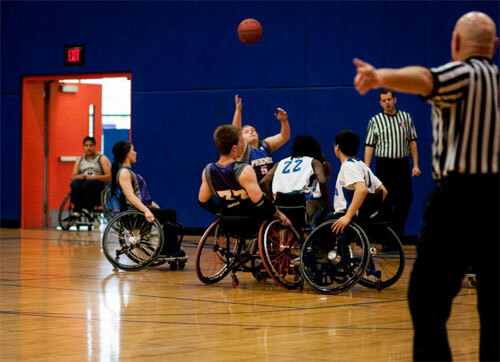 The games were and hosted by the newly resurrected Portland Wheelblazers program. The first game pitted BORP against a younger Rancho team from Los Angeles. Just a couple of years ago, Rancho was the team to beat, but now they are in a rebuilding phase and simply could not keep up with the Cruisers. James Bohnett sliced through their defense at will, and Koda Inman-Ahlstrom and Chris Rodriguez nailed open shots when the defense collapsed. Zach Penick, Christie Levine, and Cortney Outman opened the court up with relentless picking, and Rancho simply did not have an answer for BORP’s team speed. Defensively it was like watching bees swarm, and the Cruisers denied vision and opportunity every time Rancho touched the ball. By halftime, the game was clearly in hand. BORP’s coaching staff decided that James should embrace a new challenge, and he was handed the board to coach the 2nd half, with support from the staff. It was a great opportunity for him to see things from the coaches’ point of view, and the team followed his direction to the first victory of the day. The highlight of the game was provided by Christie. With less than 5 minutes left, BORP ran a play to get her an open shot from the left baseline. After working on this for a while in practice it was her time to shine in a game. Getting a screen from a teammate and a great pass from Koda, she reared back and launched her first basket in competition. The look of shock and excitement on her face was priceless. The team crushed Rancho 40-16. Next up was Team St. Luke’s from Spokane, WA. Always a great match-up, the Cruisers have not lost to St. Luke’s this season. The pace of the game was great but neither team was able to pull away in the first half. James got into foul trouble early, getting his 3rd foul on a questionable call with under 10 minutes left in the half. On the very next possession he got his 4th foul on a ridiculous call at half court. That sparked a technical foul from the bench, and cut the Cruisers’ lead to 2 points. Then St. Luke’s star Josh Brewer must have felt left out so he decided to pick up his 3rd and 4th fouls to match James. With both stars from their respective teams handcuffed with fouls, the tempo of the game changed. Koda took control of the game and was able to find James and Chris with some excellent passing. He scored 8 of his 20 points in the second half and added 6 more assists. Chris balanced out the attack with 8 points and Zach pulled down some huge rebounds while protecting the paint. Christie and Zach continued to set picks relentlessly to get their teammates open, and Cortney was amazing at talking her teammates through the switches and assignments. The team pulled out a close win over Spokane, and against all odds, James managed to avoid fouling out of the game. Action from the 2013 Western Conference Championship Tornament in Portland. Photo courtesy of Loren Bohnett. That win put the team into the semi-finals against Phoenix. 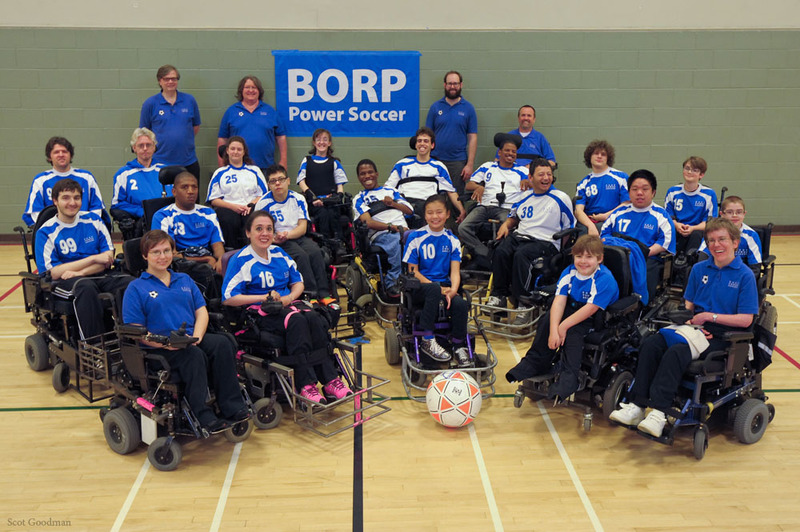 Last year, Phoenix shocked the world by not only upsetting BORP in the semifinals, but also by winning the Conference Championship. A tough team with tremendous speed and great court awareness, Phoenix faced a Cruisers squad that showed up especially focused and determined. Koda set the tone immediately, hitting his first six shots on his way to 20 points in the first half. James added 19 of his own, and William Luong and Chris added six more to the first half totals. Christie, Cortney, and Zach continued to pick, seal, and defend tenaciously to open the court up for their teammates. In the second half BORP ran a more controlled, patient style offense to work out some kinks. Late in the game, Christie got around a screen and was able to get another basket to fall. With five minutes left, BORP’s speed line-up entered to run “the Great Wall of China”, where they seal off all the opponents in the back-court to give Cortney a chance to shoot. It took a few tries to get the seals right, but finally James was able to get a great pass off to Cortney and she sank her first bucket in a game. It was great seeing how hard this team works for each other so they can each shine. The team went on to post a 71-41 victory to advance to the finals. The finals would be a rematch of what is turning into a fantastic rivalry between two great teams. Utah has a huge team, not only in the number of athletes they have, but the actual size of their players. They are led by a 6’7″ center and have three other players over 6′. Their team is bigger, faster, can shoot better, and almost all of them have very low level of impairment. BORP kids, on the other hand, have heart. There is no match for that and coming into the game BORP had beaten Utah three out of the last four times the teams faced off. The game was an instant classic. Utah took an early 8-2 lead off a couple of missed BORP opportunities, but the Cruisers were getting great looks. BORP realized that they were breaking down the Utah defense and finally got on track to come back and take the lead. The lead changed constantly throughout the game and neither team was willing to fold. Zach and Christie switched off and continued to pressure the big guy every inch of the court until he finally got so frustrated and tired that he asked his coach to take him out. Still, even with him on the bench, BORP could not pull away. With three minutes left, Utah had a 4-point lead and it was time to make a move. James took control of the game and he and Koda combined for the final ten points to take the lead a one-point lead. To win, Utah needed to inbound the ball, go the length of the court and score in just under 11 seconds. On the inbound, Koda and William pressured the ball. Zach, Chris, and James defended the big guy on the block and kept him from getting a good look at the bucket. A pick came up to free the Utah guard and William and Koda fought through it and pressured the guard into throwing a pass before he was in a good position and James shot out and stole the pass with two seconds left to seal the victory. 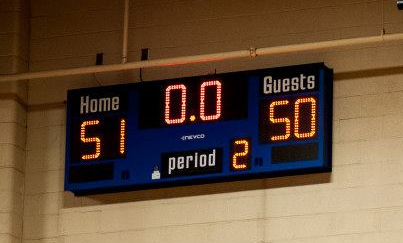 It was an amazing game, with the Bay Cruisers pulling out a 51-50 win over Utah. Final score: BORP 51, Utah 50. Photo courtesy of Loren Bohnett. 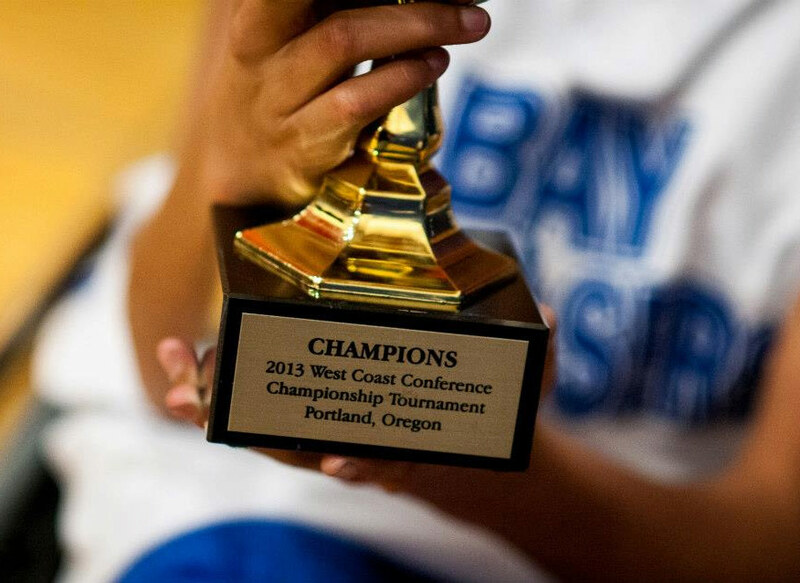 With that win, BORP became the 2012-2013 West Coast Conference Champions with a record of 13-2 on the year and advance to the National tournament for the first time in several years as a Varsity team. It was an incredible TEAM accomplishment. As Coach Trooper Johnson said, “it is so incredible to see how this group of kids have come together to support each other, to make sacrifices for each other, and to work so hard to put their teammates in a position to shine.” BORP’s picking line of Cortney, Christie, and Zach rarely get a chance to shoot (as Zach says, “I’m not programmed for that”) but they worked their butts off knowing that their individual efforts would lead to team success. The Championship trophy. Photo courtesy of Loren Bohnett.